A PERSONAL STORY FROM THE WEBMASTER DAVID MATTHEWS!!! I WANT TO SHARE SOMETHING SPECIAL THAT HAPPENED THE NIGHT OF JANUARY 23RD, 2006. IT WAS THE NIGHT OF MONDAY NIGHT RAW AND IT WAS BEING HELD AT THE CHARLOTTE BOBCATS ARENA IN CHARLOTTE, N.C. ME AND MY FRIEND FRANKIE CLEARY WENT TO THE SHOW LIVE AND THE NIGHT STARTED OUT A NORNAL MONDAY NIGHT RAW SHOW BUT IT ENDED UP BEING SOMETHING REALLY SPECIAL AND MEMORABLE THAT I WILL NEVER FORGET. THE MAIN EVENT THAT NIGHT WAS A TAG TEAM MATCH WITH CHRIS MASTERS AND EDGE AGAINST JOHN CENA AND A MYSTERY PARTNER. RUMORS WERE RUNNING RAMPANT ALL WEEK PRIOR TO THE EVENT THAT THE MYSTERY PARTNER WOULD BE NONE OTHER THAN "NATURE BOY" RIC FLAIR. WHEN JOHN CENA GRABBED THE MICROPHONE AND SAID "I WANT TO INTRODUCE MY PARTNER AND HE JUST HAPPENS TO BE THE 16 TIME WORLD HEAVYWEIGHT CHAMPION" THE CROWD EXPLODED WITH SATISFACTION.RIC FLAIR AND JOHN CENA WON THE MATCH AND EVERYONE THOUGHT THAT IT WAS TIME TO GO HOME BUT AS RAW WENT OFF THE AIR THE CAMERAS KEPT ROLLING AND IN DOING SO CAPTURED A VERY SPECIAL MOMENT. RIC FLAIR WAS LEAVING THE RING AFTER THE MATCH BUT JOHN CENA GRABBED THE MICROPHONE AND TOLD RIC FLAIR TO COME BACK IN THE RING. WHEN RIC FLAIR CAME BACK IN THE RING JOHN CENA PROGRESSED IN TELLING THE "NAITCH" WHAT A HONOR AND A PRIVLEDGE IT WAS TO BE STANDING IN THE RING WITH A MAN WHO HAS SEEN IT ALL AND DONE IT ALL, ALSO TELLING HIM THAT HE IS THE DEFINITION OF THE WRESTLING BUSINESS AND THANKING HIM FOR BEING "THE MAN"
RIC FLAIR SHOWED GENUINE EMOTION AS JOHN CENA WAS SAYING ALL OF THIS TO HIM, IT WAS REALLY A SPECIAL MOMENT MOSTLY BECAUSE IT WAS UNSCRIPTED AND REAL AND CAME FROM THE HEART. HONESTLY I HAVE TO ADMIT THAT UNTIL THAT NIGHT I WAS NOT A JOHN CENA FAN BUT AFTER THAT NIGHT AND SEEING WHAT HE SAID AND WHAT HE DONE FOR THE GREATEST PROFESSIONAL WRESTLER OF ALL TIME I BECAME A JOHN CENA FAN FOREVER. NO MATTER WHAT HE DOES IN THE FUTURE IN HIS WRESTLING CAREER I WILL ALWAYS RESPECT JOHN CENA. I HOPE YOU ENJOY SOME PICTURES OF RIC FLAIR AND JOHN CENA FROM THAT SPECIAL NIGHT. ALL I CAN SAY IS "YOU CAN'T SEE ME" WOOOOOOOOOOOOOOOOOOOOOOO!! THE PHOTO ABOVE IS A VERY EMOTIONAL RIC FLAIR AS JOHN CENA PRESENTS HIM WITH THE WWE CHAMPIONSHIP BELT IN THE ULTIMATE SHOW OF RESPECT. 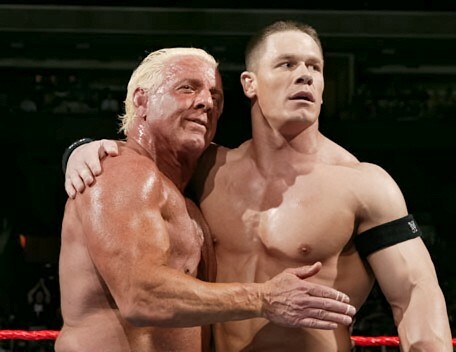 JOHN CENA EMBRACING RIC FLAIR IN A MEMORABLE MOMENT. RIC FLAIR AND JOHN CENA EMBRACE AS MEMBERS OF FLAIR'S FAMILY LOOK ON INCLUDING HIS WIFE TIFFANY AND DAUGHTERS MEGAN AND ASHLEY. RIC FLAIR AND JOHN CENA MAKE A GREAT TAG TEAM.